(Reuters) - A French soldier patrolling a business neighborhood west of Paris was stabbed in the neck on Saturday by a man who quickly fled the scene and is being sought by police, President Francois Hollande said. The soldier was patrolling in uniform with two other men as part of France's Vigipirate anti-terrorist surveillance plan when he was approached from behind around 1800 p.m. and stabbed in the neck with a knife or a box-cutter. Hollande, in the Ethiopian city of Addis Ababa, commented on the stabbing to say that the man was still on the run and police were exploring all leads. "We still don't know the exact circumstances of the attack or the identity of the attacker, but we are exploring all options," Hollande told journalists. Peyvel said the man was able to flee into a crowded shopping area in the La Defense business neighborhood before the two other soldiers, who were walking in front of him, were able to react. However, Peyvel declined to confirm or deny that description and said further details about the attacker's identity would be forthcoming. France is on high alert for attacks by Islamist militants following its military intervention in Mali in January, which prompted threats against French interests from AQIM, the North African wing of al Qaeda. The attack came days after a British soldier was killed on a London street by two men who said they were acting out of revenge for violence against Muslims. As so many of you watch the recent natural disasters we want to remind you that the greatest way you could ever assist those who are suffering or in pain is to love them. This love can come in many forms. You can pray for the individuals affected. You can, if you are guided, contribute to the organizations and individuals offering relief. You can sit in a chair, and ask God to show you one individual who needs extra love and then imagine wrapping them in the embrace of your own loving soul. You can send letters when efforts to receive that kind of love are available. If you are in the area you can volunteer your time or services. Of if you are not guided to assist in these ways you can simply pour love into your own life, knowing that the greater number of individuals who choose to live in love and peace, the greater the peace on your entire planet. There are so many ways to love and assist those in need, but the one thing we ask you to strive to avoid is "feeling bad for" those who have been affected, for in truth "feeling bad" or "feeling pity" has never uplifted a single soul on your planet earth. And although it is very human to do so, strive to change these feelings to feelings of compassion, for compassion is love. Pity says, "Poor you! This should not be! I am glad I am not you right now!" Pity is an energy of judgment, although subtle, and rarely intended. Compassion, on the other hand says, "Although we are at different places in our journey, I trust there is a greater reason for this, even when I do not understand what this is. I am going to love you through your pain. I will offer you a hand up, rather than sinking in the depths of despair with you I will be a beacon of hope and inspiration for you, for we have all known loss. We have all known confusion. We have all known the fear of not knowing how life is going to work. My heart is your heart and I love you." Compassion is an energy of acceptance, trust, and unconditional love. A compassionate heart knows that there is a higher order to all things, even those that seem incomprehensible and hurtful, and can offer comfort to those in need. For out of every natural disaster, the most amazing acts of human love and kindness arise. Communities bond. The world comes together and sets aside greed, borders, barriers, boundaries, religious, cultural, and ethnic differences and realizes you are One human race with the same hearts, the same needs, the same concerns, and in the end, the same Love. "A freight train derailed in the Rosedale section of Baltimore County about 2 p.m. Tuesday. Several cars are on fire, creating thick plumes of white and black smoke. At least eight cars derailed, and flames are visible from the wreckage. WBAL-TV is reporting an explosion occurred, and HAZMAT crews are on site. The derailment occurred in the area of E. Biddle and 66th streets." Several nearby buildings collapsed, police said. The side of a large building next to the tracks appears to be blown off. The derailment occurred in the area of Lake Drive and 66th Street. Amtrak told NBC News the derailment and fire in Baltimore does not affect their schedule. The derailed train is on CSX tracks different from the ones Amtrak uses. 1st video possibly shows some kind of foreshock / shockwave BEFORE the main explosion. 2nd video , you can hear a smaller explosion FIRST.. then the larger massive blast follows... also.. you can see the first smaller blast light up the plume before the main blast. "SALEM — It is Halloween and a commuter train packed with costumed passengers is heading through the Salem tunnel when something happens in one of the cars. The conductor pulls an emergency brake, causing the four-car train to come to a screeching halt and sending riders slamming against seats and poles. Suddenly, police are flooded with emergency calls. There is an incident in the tunnel, possibly a fire or explosion on the train. There are reports of smoke, screams and injured riders. Fortunately, this has never happened in Salem, but this will be the general scene Sunday, June 2, when the MBTA, the Massachusetts Bay Commuter Railroad, and Salem police and firefighters conduct an emergency evacuation drill inside the Salem tunnel. Although planned months ago and one in a series of annual exercises for the commuter rail system, the drill takes on heightened meaning this year, coming just weeks after the Boston Marathon bombing. The timing is not lost on the participants. “This is the real deal,” said Salem police Chief Paul Tucker, “and they’re making it as realistic as possible.”<<<<<am I gonna get to say O M G!! At a planning meeting early this year, long before the marathon, Tucker said they even discussed the possibility of simulating a bomb, or some kind of explosion on a train. This drill has a strong public component. State officials are looking for volunteers to act as passengers in the simulated incident. Halloween costumes are encouraged, but optional." To register, go to http://goo.gl/NwY0f or contact Mass DOT at nboyd@mbta.com. Participants must be available from 7 to 11 a.m. that day and sign a waiver.<<sign a waiver? all righty then..so if you are injured you are on your own?? or is it really a non-disclosure?? I am gonna snip some and put what I think important in here highlighted. Although a T official said this drill is not a response to the Boston Marathon bombing, he acknowledged that the two events are not unrelated. << why mention that, nothing like this drill. So how many trains have derailed recently? and now they want to do a drill (let's hope it doesn't go live) and encourage people to wear Halloween costumes to the event..at the beginning of JUNE? ? WTH??? Seems shady to me... Especially with the waiver. If its one thing I've figured out whenever a "disaster exercise" is going down its best to leave town for a few days. Er, yeah, I wouldn't be anywhere near those train tracks on June 2. Or probably on any train tracks, anywhere. I've never heard of a train-related disaster exercise. Breezy, this may be tying together this wave of train-related accidents we've been seeing. If I see an announcement of a bridge falling drill, I'm pretty sure I will lose it!! In an odd turn of events, firefighters were the ones starting the fires at the latest austerity protest in Spain. Spanish firefighters clashed with riot police in Barcelona Wednesday as they protested against spending cuts in Catalonia, the economically powerful northeastern region of the country. Hundreds of public employees, sporting yellow helmets and red jackets, gathered in front of Catalonia's parliament building. Some ignited flares, threw smoke bombs and burned makeshift coffins labeled "public services." Labor unions that represent the firefighters warned in a statement that the proposed reductions in staff and spending put the "safety of workers and the people of Catalonia" at risk, according to Agence France-Presse. Thanks T. Pretty soon I will be adept at reading between the lines. This story was so hinky, it gave me a weird feeling right away, like this is so surreal, surely it can't be true. Halloween costumes?? in June?? NO way would I want to be anywhere around that tunnel/train/tracks/drill. Between all those incidences, things blowing up, (another today, by the way, a house in Queens, New York City) I'm with you guys, suspicious as heck, thanks to KMRIA/Believing and Kandescent, you did cause my vibes to raise with your comments. Bridge falling drill INDEED!! and I agree, I think I might just lose it too. I begin to think the world has totally taken leave of it's senses on a permanent basis. "A woman handing out pizza samples at a Virginia Costco was shot and killed by sheriff's deputies Wednesday afternoon after she began acting strangely and came at the officers with a weapon, authorities said. A sheriff's deputy also was wounded in the leg, possibly by a ricochet. He is expected to recover. The melee began at about 3 p.m., when store employees noticed the woman acting oddly at the Costco in Sterling, Loudoun County Sheriff Mike Chapman said." "Nora Lateef said she was at the food court when she saw three deputies rush into the store and head toward the employee lounge, asking, "Where is Linda?" Soon, Lateef said, she heard five shots and the store was evacuated. They were saying "everybody out of the store! Out of the store!" Lateef said. Three deputies could not subdue her, so they had to fatally shoot the woman by firing 5 shots, in a store full of people. That's astounding. The woman came at them with a knife and scissors. And they shot her dead. I'm sorry to say that now I'm feeling like we'll see more of these types of incidents-- excessive force. And as for the recent escalation in crazy, I'm not sure what that's about. The Sun?? And as to the train drill, if nothing goes wonky this weekend, I'm thinking we need to keep our eyes open come Halloween time... on a train... probably not anywhere as obvious as Salem (where one would first think about there being witches). There it is. The "drill" will probably be a fire. You know, burning witches in Salem. Let's hope it doesn't go live. The report claims she came at them with scissors..
She just 'out of the blue' started acting strangely. IMO, our law enforcement people are able to suppress sudden weirdness without shooting them. They do it all the time. I wonder who she really was. "Nearly 76 years after famed aviator Amelia Earhart vanished without a trace during her daring attempt to fly around the world a team of researchers say a sonar image may have found her plane's wreckage in the Pacific Ocean. An object resembling a 22-foot-long airplane wing is seen in newly acquired photos taken off the coast of Nikumaroro Island — a remote island already long suspected as Earhart's final resting place. "It looks unlike anything else in the sonar data, it's the right size, it's the right shape, and it's in the right place," The International Group for Historic Aircraft Recovery (TIGHAR), the organization behind the search writes on their website. In July 2012 TIGHAR photographed the underwater area surrounding the island but after spotting few clues themselves published it to their website for extra help from the public. It wasn't until March that a member of TIGHAR's online search forum pointed out the peculiar object resting approximately 600 feet below the water's surface. "Once you know what to look for, the anomaly is painfully obvious," TIGHAR says of the grainy image." RELATED: COULD THIS BE AMELIA EARHART'S PLANE? Istanbul, Turkey (CNN) -- An uneasy peace returned Sunday to Taksim Square, site of Turkey's biggest anti-government protest in years. Thousands of demonstrators remained in control of the square after Turkish security forces abandoned the district Saturday following 36 hours of vicious clashes and angry demonstrations against the government. Protesters erected makeshift barricades at the entrance to the square, which holds huge symbolic importance for Turkey's leftist political parties and labor movement. However, there were reports of confrontations in at least one other neighborhood in Istanbul and in cities such as Ankara and Adana, where a man told CNN the situation was bad. "There is civil police arresting people all over the place," Cenker Kardesler said by phone. "The police tried to corner the people. They came at us from both sides." In Taksim Square, tensions remained high between protesters and police, but there were only scattered demonstrations Sunday. Many people joined in cleanup efforts, helping municipal workers. It was a far cry from Friday and Saturday, when this bustling neighborhood was a battleground as riot police used water cannons, tear gas, pepper spray and armored personnel carriers to prevent protesters from entering this transit and commercial hub at the heart of the city. Saturday afternoon, police withdrew after firing several last volleys of tear gas at crowds, sending thousands of screaming people fleeing for cover. Police used similar tactics in the Istanbul neighborhood of Besiktas early Sunday, a resident said. A woman who was on her way to buy groceries told CNN she saw police using tear gas and people fleeing in terror. Turkey's semi-official news agency reported that more than 700 people have been detained since Tuesday, and most have been released. Andalou News Agency said 58 civilians are still hospitalized and 115 security officers have been injured. There have been protests in 67 of Turkey's 81 provinces over the past four days, Andalou reported. This was a peaceful protest against the re-development plans in Gezi Park Turkey. We are seeing protests against government plans throughout the world i.e. Greece & Spain to name but 2. These events are just not reported in MSM on your TV . " why ? " - to keep you quiet ! I want to see the armed forces one fine day turn around and say " enough ! we will not treat our people like this any more " " i will not injure, maim, or kill my fellow human on the say so of this government or any other, i refuse to be used as a tool to keep TPTWere in luxury while many fine and good people are dying "
Yes & thank you Kandescent for your post. A helicopter carrying Iranian President Mahmoud Ahmadinejad and a group of government officials has been forced to make an emergency landing in a mountainous region in northern Iran. "No-one was hurt in the incident on Sunday, the president's website said. The pilot reportedly managed to land the helicopter safely in the Alborz mountain range. He was on his way to inaugurate three road projects, including Iran's biggest road tunnel, in Mazandaran province, when the helicopter came down, reports said. "The president and his accompanying delegation are in perfect health and the crashed helicopter stayed at the crash site for repairs," the news agency Mehr said. Mr Ahmadinejad is believed to have returned to Tehran by road." The fire broke out at a slaughterhouse in Dehui in Jilin province early on Monday. Accounts speak of explosions prior to the fire, which caused panic and a crush of workers trying to escape. Most exits were said to be locked. A labour activist told the BBC it was the worst factory fire in living memory. The fire is now said to have been mostly put out and bodies are being recovered. President Xi Jinping, who is on a visit to the Americas, ordered every effort to go into the rescue operation and treatment of survivors, adding that the investigation into the cause of the accident would be vigorous. Sources including the provincial fire department suggest there may have been an ammonia leak which either caused the fire or made fighting the blaze more hazardous. Other reports speak of an electrical fault. It is China's deadliest fire since 2000, when 309 people died in a blaze in a dance hall in Luoyang, in Henan province. About 100 workers had managed to escape from the Baoyuan plant, Xinhua said, adding that the "complicated interior structure" of the building and narrow exits had made rescue work more difficult. It said the plant's front gate was locked when the blaze began, and other official media reports said there was only one unlocked door in the whole building. Firefighters have still not completed the job of recovering bodies from the building, meaning the death toll may rise yet further, say correspondents. Some 60 injured people have been sent to hospital, but the severity of their injuries remains unclear. State media quoted hospital staff as saying that some wounded were being treated for inhalation of toxic gases such as ammonia while others had burns of varying degrees. Pictures from the scene showed the roof mostly burned away to reveal blackened, twisted girders. The provincial government said it sent more than 500 firefighters and at least 270 doctors and nurses to the scene, evacuating an area nearby that is home to 3,000 people as a precaution, reported Reuters news agency. "Queen Elizabeth II marked the 60th anniversary of her coronation Tuesday with a ceremony at Westminster Abbey attended by some 2,000 people, including nearly two-dozen members of her immediate family. Various members of the Royal Family arrived at the abbey ahead of the Queen, including Prince Charles and the Duchess of Cornwall, Prince William and the Duchess of Cambridge and Prince Harry. Prince Philip, who missed a gala event Monday evening due to illness, was at his wife’s side for the service. The Queen arrived at the abbey in the Coronation Carriage, the same one she rode in 60 years ago. Her dress and matching coat were similar in colour to her oyster silk coronation gown. The 87-year-old monarch was crowned at Westminster Abbey on June 2, 1953, after a period of mourning following the death of King George VI in February, 1952. The crown used in that lavish affair -- the 350-year-old St. Edward's Crown -- sat on the altar for the anniversary ceremony. Tuesday marked the first time the crown has left the Tower of London since the coronation." TRAIN DERAILMENTS ARE GETTING POPULAR. HMMMM..Will put them here for now. may have to have it's own thread before long. June 5, 2013 (WPVI) -- A source tells Action News that one person was killed in a building collapse on Wednesday in Center City Philadelphia. The Moscow Metro has resumed service after a morning rush hour fire injured 76 and caused panic underground. Some 4,500 commuters were evacuated from smoke-filled stations, with the busy Red Line partly closed for hours. At least 76 people were injured in the incident Wednesday morning at downtown Moscow’s Okhotny Ryad station, medical officials reported. Sixteen of them, including a 15-year-old girl, were taken to hospital. Those admitted had suffered from smoke inhalation and stress-related ailments like neurosis and high blood pressure. Three patients are in intensive therapy, but their lives are not in danger. A 24-year-old woman in critical condition from smoke poisoning has been taken to intensive care. She passed out while inside the smoke-filled station, and was then rushed to Sklifosovsky Institute of Emergency Medicine in central Moscow. The line was briefly closed for a second time after midday, less than an hour after resuming service in test mode, when smoke was again reported in the tunnel. The smoke came from the same site affected by this morning’s fire; it is suspected that a newly repaired electric cable was damaged by a short just after power was restored. An estimated 4,500 people were evacuated from the Metro, and some trains were stopped inside tunnels when the flames first erupted. All stranded passengers and Metro employees have been rescued, and the evacuation ended about an hour after the incident began. The fire broke out at approximately 8:30am Moscow time (04:30 GMT), and firefighters managed to quickly douse the blaze. The cause of the fire has yet to be determined, but a preliminary investigation indicates a technical failure in a power line inside a tunnel, the Moscow Emergency Ministry said. Moscow’s Investigative Committee said it will conduct an inquiry into possible violations of safety regulations on the Metro. 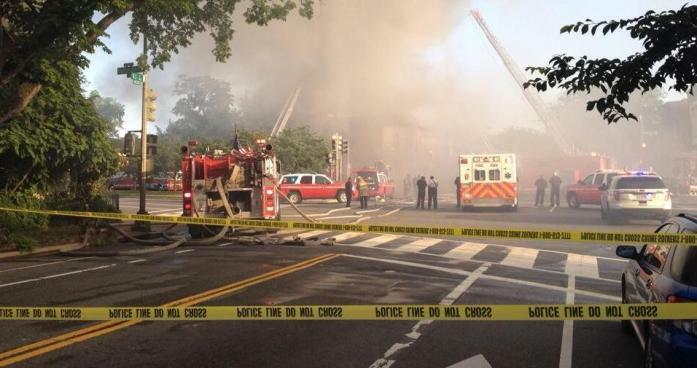 "More than 100 firefighters battled a 4-alarm fire at a Capitol Hill hardware store Wednesday evening, spanning four buildings. Smoke plumes eminating from Frager's hardware store at 1115 Pennsylvania Ave. SE were seen miles away. Crews arrived to the scene just before 7 p.m.
As of 7:30 p.m. there were no injuries reported." With the events that have taken place and continue to take place (including an M-class solar flare this evening), credible science points to us being at a critical junction with respect to the North Atlantic Tsunami Watch. The sun is putting out more electromagnetic energy than we had originally predicted for our May 20 - Jun 05 threat window. There is also some very interesting information that has just been released (June 3rd) by UNESCO. We believe this is not coincidental. Please take a look at the enclosed information below. Based on what you have seen occur so far, if you would like to increase awareness, please feel free to post the information on your Website (with the following phrase: "Permission granted by Dr. Simon Atkins of Advanced Forecasting Corporation"). You may also distribute this post to social media, as well as your e-mail distribution list. 1) Large solar flares; high geomagnetic activity; new “arc of light” – the so-called "interplanetary" source that NASA says they don’t know where it came from – which we believe was a PULSAR WAVE from beyond the sun (but it causes the sun to emit a new frequency of light); development of a massive coronal hole releasing a huge solar wind; massive electron belt around Earth; proton events – all happening at once ... rare. CHECK. 2) North Atlantic earthquake activity (Greenland coast to Ireland / British Isles to Bermuda – all between 4 and 5 on the Richter Scale) – all happening during Threat Window ... rare. CHECK. 3) Multiple (9+) volcanoes exploding all at the same time (Picaya [Guatemala], Cocahue [Chile], Etna [italy], Popocatepetl [Mexico], Mayon [Philippines], Sakurajima ]Japan], Turrialba [Costa Rica], Yasur [Vanuatu], Nyiragongo [DR Congo] – all happening at once (within a very small window of around 2 weeks) ... rare. CHECK. 4) Extreme severe storms in Central USA w/ widest tornado EVER recorded (@ 2.6 miles); 500-YEAR massive flood in half a dozen EU nations. Formation of Tropical Storm Andrea against high wind shear, path of flooding to-be up US East Coast … rare. CHECK. 5) Large slide in the Nikkei, currency reversals, and then a 'special' Hindenburg Omen 5/31/13 – all occurred within the last 2 weeks ... rare. CHECK. 6) Multiple country power grid shut-down's (Vietnam, Thailand, Kenya) – rare. GOES satellite went down! – rare. CHECK. 7) Social chaos: Turkey uprising; geopolitical aggravation escalating (Russia v. USA in Syria; Israel, etc. ), IRS scandal, abnormal violence in broad daylight then waiting for police; human-to-human transmission with the coronavirus nCoV with 60% fatality rate – all ramping-up at the same time ... rare. CHECK. A) Electromagnetics from the sun comes in the form of solar flares, CMEs (Coronal Mass Ejections), solar wind, proton events, high density electron swarms and more. These cause geomagnetic activity in the form of the Northern Lights and can disrupt telecommunications (i.e., GOES satellite is dead). B) Planetary electromagnetics is a non-conventional science, but we at AFC are making major advancements in parallel to our motto, Crossing New Thresholds®, in predicting the “windows” of higher risk. It’s similar to predicting a severe thunderstorm outbreak, but the risks / threats are bigger than that and thus the parameterizations are more complex. C) Given everything that has happened, we made the decision to advise-warn given the credible science showing that a potential threat (strong North Atlantic earthquake activity caused by a ramp-up in solar energy) was there, rather than not warn and have this potential major Black Swan occur. High Threat Window Prediction Came True; Waiting For Solar Activity To Decrease To Take ‘Off’ Tsunami Watch. Around the world news from Turkey, what the MSM dont tell the masses, keep it quiet and hopefully it will go away ! Another train derailment-- and in Baltimore again. A CSX train carrying trash from upstate New York derailed Friday evening in Lansdowne, Baltimore County officials said. No injuries were reported, and police said the train was not carrying hazardous materials. "No injuries, no fire, no hazmat," said Cpl. Cathy Batton, a county police spokeswoman. Ten railcars left the tracks about 8 p.m., with four landing on their sides, CSX spokesman Gary Sease said. The derailment occurred on tracks that parallel Hammonds Ferry Road near Elizabeth Avenue. The train, with two locomotives and 52 railcars, was traveling from Selkirk, N.Y., near Albany to Richmond, Va., Sease said. He said all of the cars were carrying "municipal or commercial waste." "We've got a lot of resources on site, and we'll be working there on scene making sure everything is put back in order," he said.